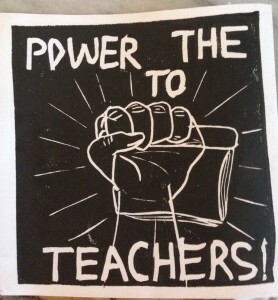 “When our unions are under attack, what do we do? Stand up, fight back!” This was the chant from nearly a hundred activists greeting anti-union attendees at a Freedom Foundation fundraising banquet last Friday. 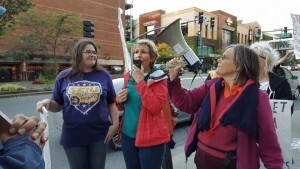 Amidst rush hour traffic and blustery winds, protesters representing a broad range of unions walked a lively, loud, and disciplined picket line outside the Bellevue Westin Hotel to protest and expose the Foundation, which aggressively promotes “right to work” legislation against labor unions. The protest was an impressive show of growing unity against the Foundation’s ultra-right agenda. Dubbed the “Freeloaders Foundation” by picketers because right-to-work laws give union benefits to those who don’t pay union dues, the Freedom Foundation has political and financial ties to major conservative, pro-business foundations and individuals. They include Donors Trust, State Policy Network, American Legislative Exchange Council (ALEC), the Koch brothers, Walton Family and the John Birch Society. 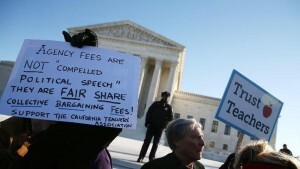 The Foundation is not only targeting unions. They oppose taxing the wealthy, government regulation of businesses such as anti-discrimination and minimum wage laws, and environmental protections. They also back charter schools, and oppose public employee pensions, funding for women’s reproductive freedom and all public services and programs. The Foundation has been an enemy of unions since 1991, when it started harassing teachers’ unions with lengthy and expensive lawsuits. Now, using state public disclosure laws, the Foundation’s lawyers are demanding the names, birthdates, and work email addresses of all state union employees. 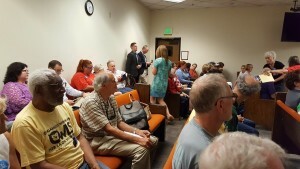 On July 29, a Thurston County judge ruled for the Foundation, but several unions won an emergency stay and are appealing the ruling. The group plans to use employees’ private information and voter registration records, to get state workers’ home address and phone numbers and mount a direct-contact campaign. Currently, it is door-belling individual healthcare providers at their homes — members of Service Employees International Union Local 775 — in a well-funded campaign to pressure them to withdraw from their unions. An SEIU 775 member told the crowd of the unrelenting harassing emails and unwanted visits she has received, pressuring her to “opt out,” of the union. Against such bullying rightwing politics and tactics, it is not surprising that Friday’s picket line in Bellevue included members of several state employee unions, Carpenters, Washington Education Association, SPEEA, Teamsters, several Retiree groups, healthcare providers, members of Hotel Employees, Restaurant Employees, and the Martin Luther King County Labor Council, to name a few. 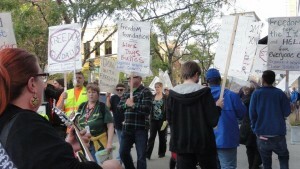 Home-made signs and the rank-and-file composition of the crowd gave lie to the hired “rent-a-mob” image that Foundation leaders had boosted in a failed effort to discredit the protest. At least one Foundation donor expressed surprise when he learned that protesters weren’t being “paid,” as claimed. Many of the speakers expressed their commitment to confront and expose the ultra-right politics and activities of the Freedom Foundation, and to build a movement capable of uniting and defending the many different constituencies on the right wing’s hit list. Fill the courtroom on July 29! Support the motion, brought by several unions, for an injunction to block the Freedom Foundation’s demand for the name, birthdate and contact information of every union represented state employee. This court hearing will decide if the State of Washington must turn over union members’ private information to the ultra rightwing Freedom Foundation’s (FF). The Foundation is bankrolled by big business associations. Its goals include pushing racist, union-busting “Right-to-Work” laws, and slashing public services. They use mailings, phone calls, home visits, and TV ads to convince workers to dump their unions and “opt-out” of paying dues, bankrupting the labor movement – our front line defender of public services and working people. Don’t let it happen! 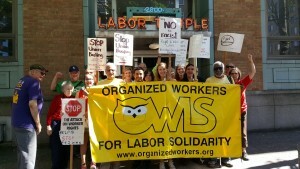 Organized Workers for Labor Solidarity (OWLS) is carpooling to the hearing. Join the caravan! Wear union colors or a red T-shirt! For carpool info, call 206-261-1420. In their endless drive to roll back the clock on workers’ rights, the Freedom Foundation has declared war on public-sector unions in Washington State and Oregon. Using the courts, legislature, and door-to-door campaigns, they are casting themselves as champions of the “little guy” against “big government.” Nothing could be further from the truth! Find out who is behind this highly organized, well bank-rolled Foundation, and the real goals of their anti-freedom agenda. Bring your ideas for how to build a united defense campaign against the anti-union attacks of the Freedom Foundation, and similar rightwing groups. 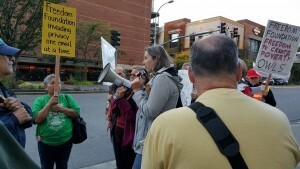 Also, learn about the latest labor battles around Puget Sound – or bring news of your own! Saturday, December 19, 7pm — Celebrate the 2015 Year of Labor Solidarity with OWLS … and help raise some dough to help raise more hell for workers’ rights in 2016! Potluck. 4117 Wallingford Avenue N. Seattle. 206-632-1022 for directions. See you there! There are two important actions on Wednesday, June 10th your help is needed on. The first is to support the Amazon security workers who’ve been battling the huge corporation to demand fair treatment, an end to retaliation for union activity, an end to discrimination and – of course – the right to union recognition and decent wages and working conditions. Later that day, we’ll join Familias Unidas por Justicia to tell PCC that they should stop selling Driscoll berries until Driscoll stops buying their berries from Sakuma Brothers.Farmworkers at Sakuma Brothers Farms in Burlington are demanding fair treatment, decent working conditions and the right to their union. For over a year they’ve been working to get union recognition and a union contract. They’ve taken job actions including strikes, and built a base of community support. Sakuma Brothers tried to replace them with 438 H-2A immigrants, pretending that labor wasn’t available, but was forced to back down. The workers are asking for a boycott of Sakuma Brothers berries, a boycott endorsed by the Washington State Labor Council. 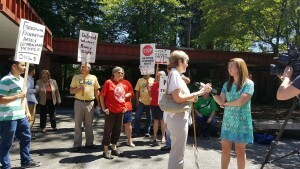 Tell PCC: No Driscoll berries! Please come to one or both actions – and wear your union colors!